Happy New Year! Welcome to the 4th year of Happy Birthday Author!! It all began in 2010 when I was revisiting file folders full of lesson plans and author birthday calendars from my days as a fourth grade special education teacher. 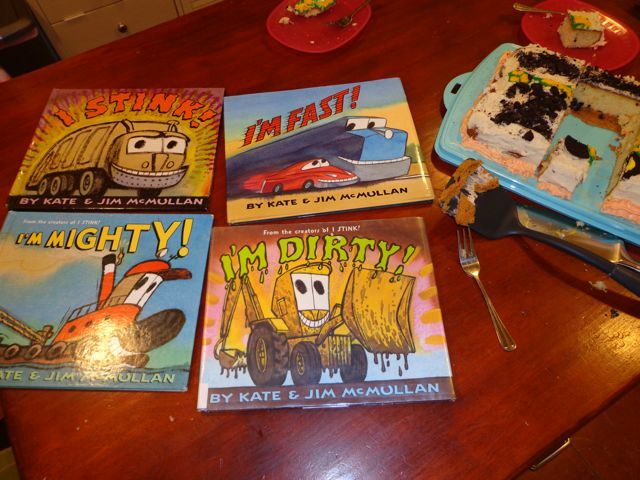 I stumbled upon the birthday of Kate McMullan, the author of I Stink. That night, after dinner, I needed an activity to do with my children before bedtime. 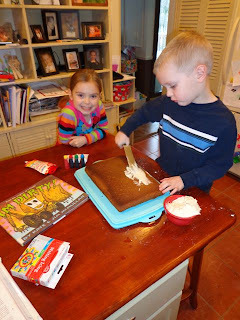 I pulled a cake mix from the cupboard and told them that we would bake a cake to celebrate the birthday of the author who wrote my son's favorite book. 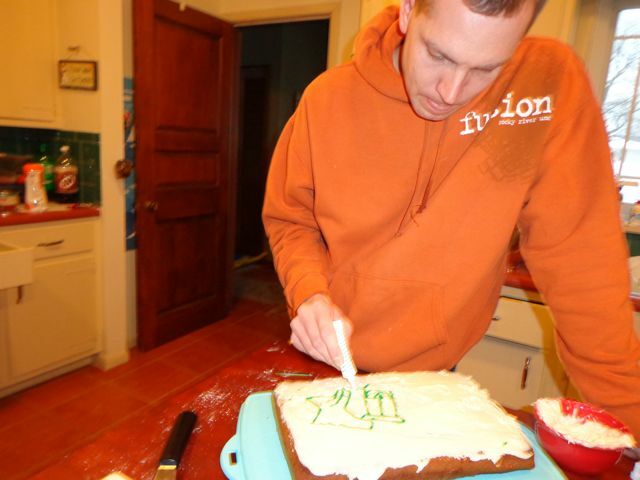 I never thought that a cake mix would change my life, but it did! My family has now celebrated over 170 children's author and illustrator birthdays. Each one has been its own unique experience. We have read thousands of picture books, most of them more than once. Last September, we traveled to Washington D.C. for the National Book Festival and my children got to meet many authors face to face. Life is crazier than ever, but the photos below are everything I need to stay focused on creating more memorable reading experiences for my family. "I'm Growing" -- maybe we could get Kate and Jim McMullan to work on a book with that title! Until then, I guess we will read I'm Big! It looks like I have many more birthday celebrations to come with these two! Jim and I are currently working on a fire truck book, I'M BRAVE! Jim will begin the final paintings soon and I'll be putting them up on my web site, katemcmullan.com. 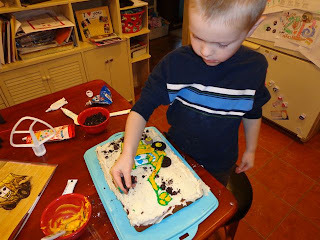 We have our fingers crossed that our next picture book project will be about a Zamboni. What to call it?? I'M COOL? How am I spending my birthday? By spending the whole day READING! And next week I'll have my birthday lunch with Jean Marzollo. 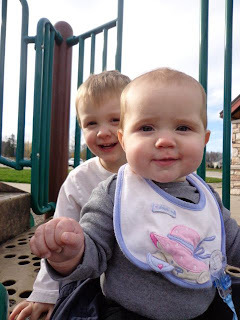 Kate, thanks for sharing! It was exactly what I was hoping to hear -- more books for cakes! Oh, if you would like to hear more about her birthday lunch tradition with Jean Marzollo, click here! For this year's cake based on Jim and Kate's book, we decided to make an I'm Dirty! cake. My son asked me a half dozen times, "Is it time to decorate the cake, yet?" Each time I said, "Not quite, but almost," my words were met with a groan. 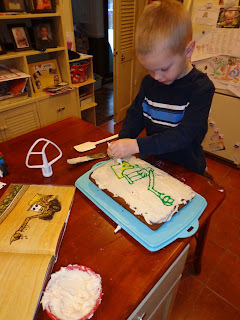 It was pretty clear that he was really looking forward to continuing the tradition of decorating a cake with a character from a book by Kate McMullan. When I finally had everything I needed on the kitchen counter and I said, "It is time to decorate. 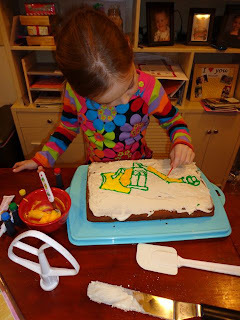 But, as I read I'm Dirty I want you to pick the illustration from the book that you want on your cake." This was a little different than the previous cakes because we just decorated the illustration from the front cover. 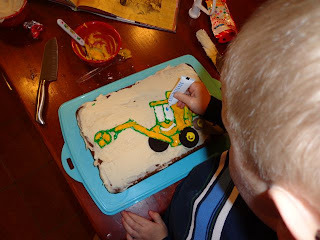 He looked for the perfect illustration by Jim McMullan, as we read the book about an energetic backhoe loader that counts backwards as he cleans up a messy lot, removes a stubborn tree stump, and takes a mud bath! I was so happy that his sister chose to help us out with this one! I sketched out an outline of the backhoe loader illustration that he chose from the book. 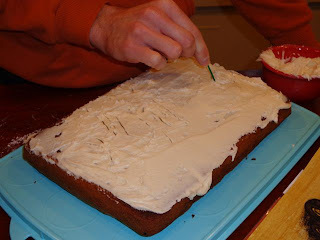 Then, I outlined it in green icing. I thought I had black icing in the cupboard, but I was mistaken. Therefore, our backhoe loader looks a little more John-Deere-like than Jim McMullan's illustration! The experienced cake decorators took over from there for the rest of the decorating. She used a toothpick to get in the tight spots. 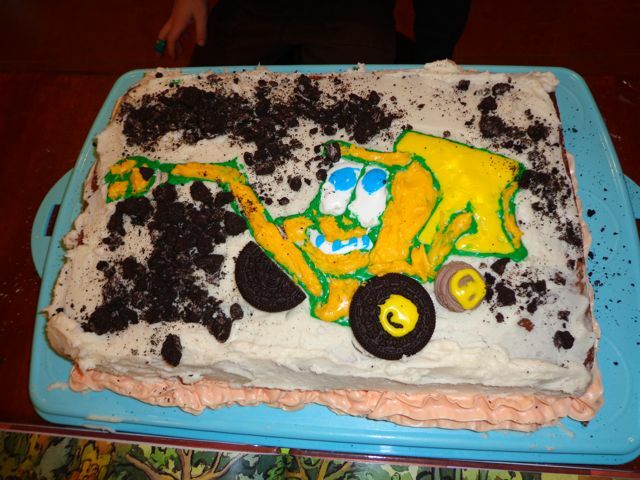 He brought the backhoe loader to life by adding the eyes. Lots of crushed Oreos for dirt. A before bedtime snack -- YUM! 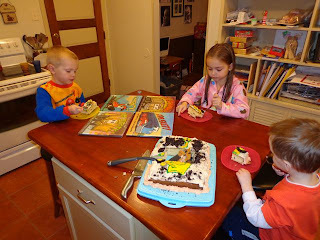 Is there anything better than birthday cake and books? Click here to see last year's birthday celebration. I read I'm Fast to my son's preschool class! Happy Birthday Kate- such an inspirational picture book author. I can't believe you guys have made all those I'M.... cakes! That backhoe loader is just a work of art! Thanks Joanna! They did a great job on the cake! Wow! You all did a great job on those cakes! I love Kate and Jim's books. What a team! Have you read their NOEL books? My daughter loves those. Delighted to help you wish Kate a happy birthday! She is such a wonderful person, and talented writer. 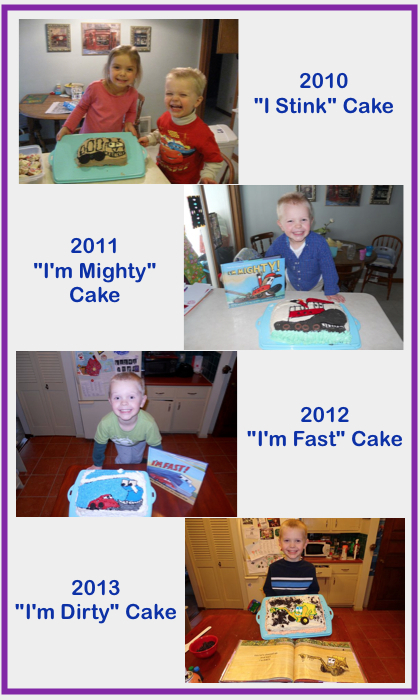 Love all the "I'M" cakes!!! Thanks again for sharing on FB! Very appreciated! What FUN! And you guys are serious cake artists! I'm sure it was delicious :) Happy Birthday, Kate! We love birthday cake! Who loves to smash the cake with ice cream? Thank you for sharing Kate! I am so glad you enjoyed the post! Thanks again for sharing your book news and birthday plans. Tell Jean we said hi! That is an ADORABLE idea!! Fantastic! I love making creative birthday cakes for the kiddos! I'll have to try my hand at this idea!